The research team—Virginie Sanial, Ken Buesseler, and Matthew Charette of Woods Hole Oceanographic Institution and Seiya Nagao of Kanazawa University—hypothesize that high levels of radioactive cesium-137 released in 2011 were transported along the coast by ocean currents. Days and weeks after the accident, waves and tides brought the cesium in these highly contaminated waters onto the coast, where cesium became “stuck” to the surfaces of sand grains. Cesium-enriched sand resided on the beaches and in the brackish, slightly salty mixture of fresh water and salt water beneath the beaches. But in salt water, cesium no longer “sticks” to the sand. So when more recent waves and tides brought in salty seawater from the ocean, the brackish water underneath the beaches became salty enough to release the cesium from the sand, and it was carried back into the ocean. 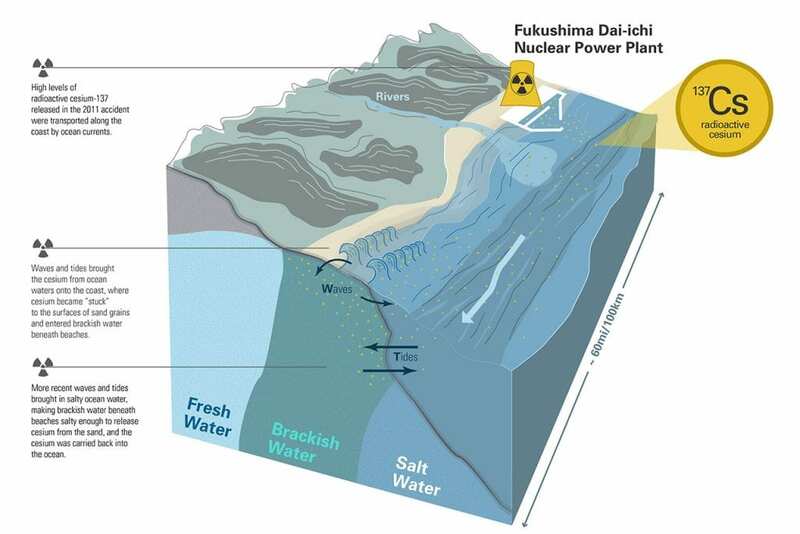 “No one expected that the highest levels of cesium in ocean water today would be found not in the harbor of the Fukushima Dai-ichi nuclear power plant, but in the groundwater many miles away below the beach sands,” said Sanial. The researchers also conducted experiments on Japanese beach samples in the lab to demonstrate that cesium did indeed “stick” to sand grains and then lost their “stickiness” when they were flushed with salt water. “It is as if the sands acted as a ‘sponge’ that was contaminated in 2011 and is only slowly being depleted,” said Buesseler. “Only time will slowly remove the cesium from the sands as it naturally decays away and is washed out by seawater,” said Sanial. 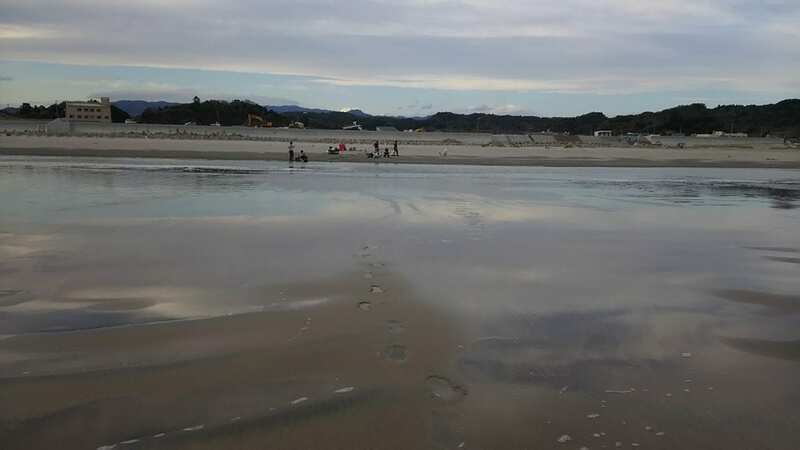 The research team sampled eight beaches in Japan within 60 miles of the crippled Fukushima Dai-ichi Nuclear Power Plant and found high levels of radioactive cesium discharged from the 2011 accident in the brackish groundwater beneath the beaches. The cesium did not constitute a public health concern, but it showed how radioactive material can be transported far from accidents sites, where it attaches to and is stored by sand grains. 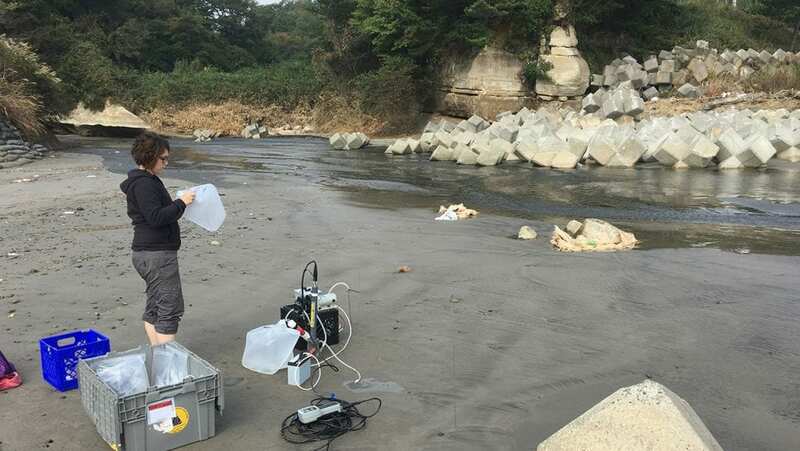 Virginie Sanial, a scientist at Woods Hole Oceanographic Institution, samples groundwater beneath beaches in Japan. She plunged 3- to 7-foot-long tubes into the sand, pumped up underlying groundwater, and analyzed its cesium-137 content.